Cape Breton Island | Turning my world upside down! We docked in Sydney, NS after a mostly sleepless night on the ferry. The adventure was to drive the Cabot Trail, so off we went with stop at the nearest beach, Ingonish, where we had a delightful nap in our camper – ahhhh!!! Waking refreshed around lunch time, we had a light repast of green grapes while sitting on the beach. At least that was better for us than ice cream. 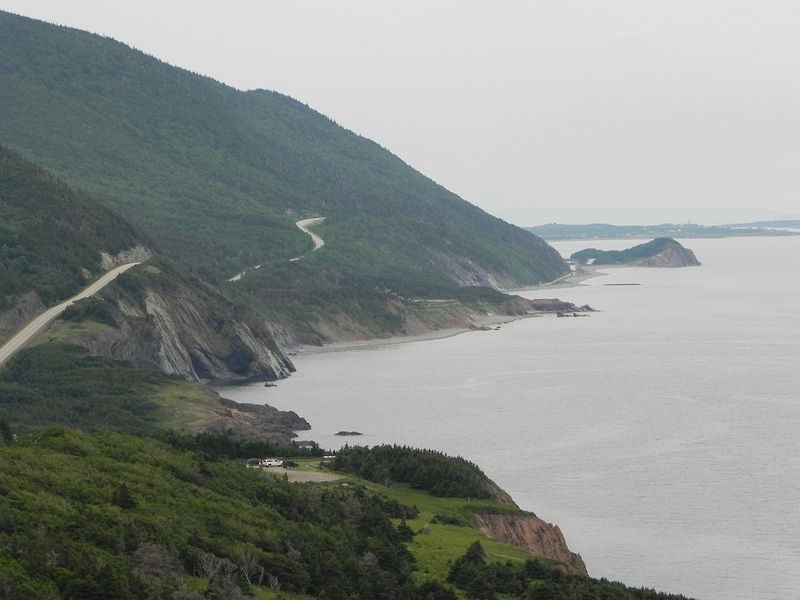 Then we drove on, looking for Meat Cove, which is supposed to be where the Gulf of St. Lawrence meets the Atlantic Ocean. We drove to the northern-most tip of the province, through about 8 kms of very bad dirt road, where you really don’t want to get too close to the shoulder. Leon was pretty tense and the camping area we found was up very high, but really not something we would seek out for a restful night. There seemed to be a great number of vehicles with kayaks about. We wondered if a kayak convention wasn’t in the offing. At any rate, we drove to the local café, Leon had a nice piece of apple pie with ice cream to steady his nerves, and we drove back to the main road to continue on the Cabot Trail. You see, Leon was a little nervous about the potential of rain and the road becoming difficult to negotiate with anything less than a leopard tank, minus the gun turret, of course (we didn’t want the British to think the French were trying to take back their former territories). Back on the Trail, we found quite a few lovely vistas, but unfortunately, the pictures don’t do them justice. At one point, we spotted a pod of whales, but they were feeding, so they didn’t put on a big show while they were thus occupied. The best you might see is a fin or two and the occasional spout of water. By now, it was getting late and we had just realized that it was a long weekend in NS. Finding a campground to stay for the night would be tricky. 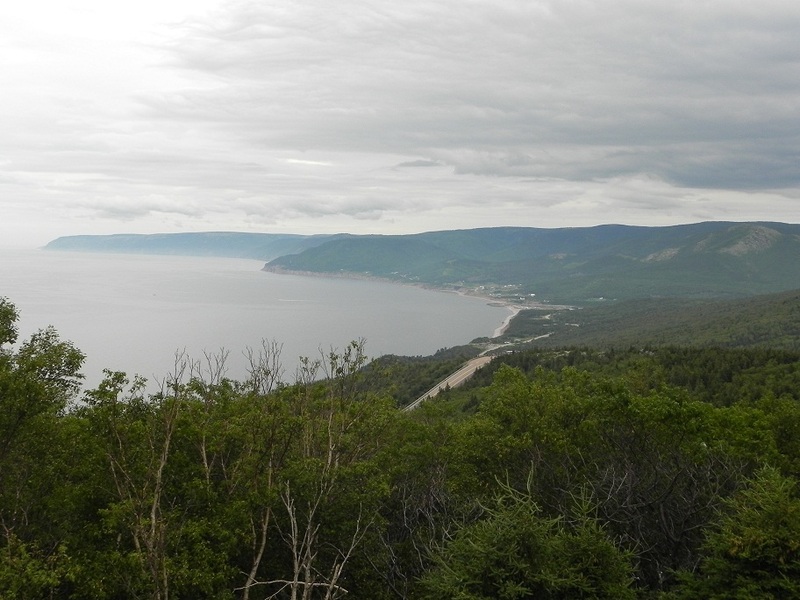 We settled on Chéticamp, another Acadian village, on the edge of the Cabot Trail. The campground had great potential, with a private beach and all the services. 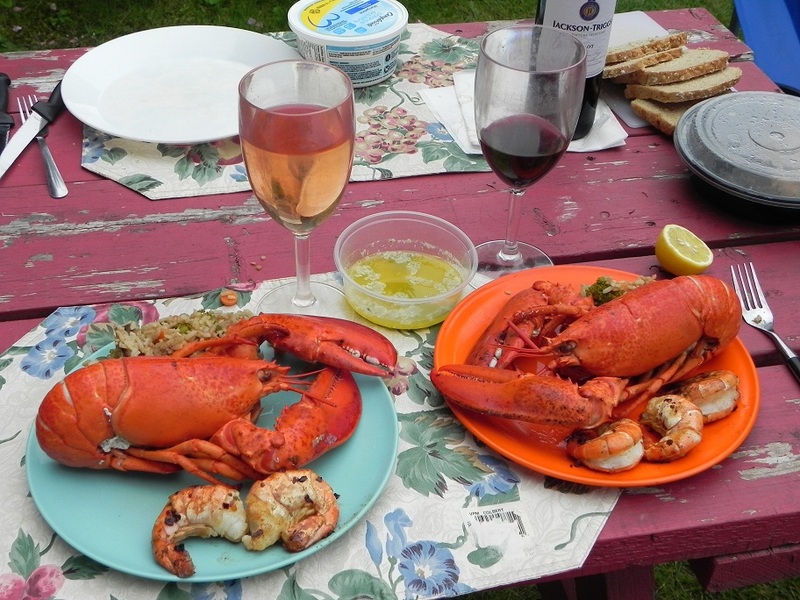 The people were friendly enough and we had a great dinner planned with local lobster and some giant prawns featured on this French chef`s menu du jour. The wine was poured, the garlic butter was heated, but the neighbours decided to put their baby down for a nap before their own dinner. So we were treated to a symphony of cacophonous melodies. Two children screaming, small dogs a barking, families talking late into the night…Leon managed to enjoy dinner and fell asleep soon after 9pm while I wrestled with my menopause-induced insomnia. Let’s just say that there are times when the sound of a butterfly’s wings is enough to keep me awake.